Carn Eighe and Mam Sodhail are twin peaks on a crescent shaped ridge of mountains which enclose Gleann a' Choilich. Carn Eighe has a triangular pyrimidal summit cone at the convergence of three ridges. The NNW ridge connects to Beinn Fionnlaidh via a col above Coire Lochan. 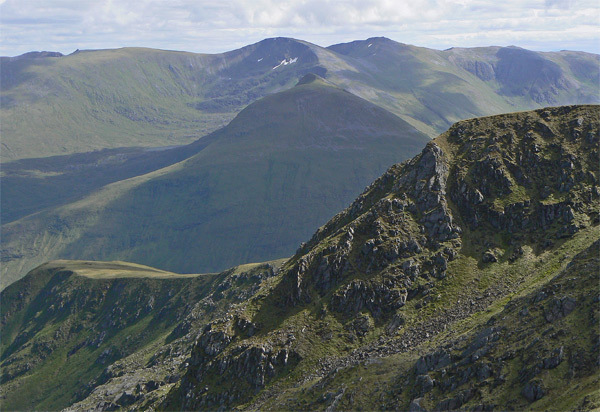 The short SSW ridge connects to Mam Sodhail via a narrow col above Loch Uaine and is a normal ascent route. The long winding E ridge leads to Tom a Choinich 4.5km away, but after 2.5km, a descent SE to the path in Gleann nam Fiadh is possible. Looking from An Socach to Carn Eighe, with Mam Sodhail on its right and Beinn Fhionnlaidh in front of it; 14th June 2007. 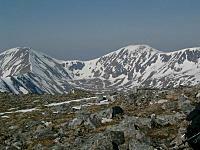 The summary information of one or more ascent routes that include Carn Eighe. A good day with Mam Sodhail visible in the background. 26/06/2012. James enjoying the views from Carn Eighe Trig point with the ridge behind leading to Tom a Choinnich which is just visible in the distance. 26/06/2012. 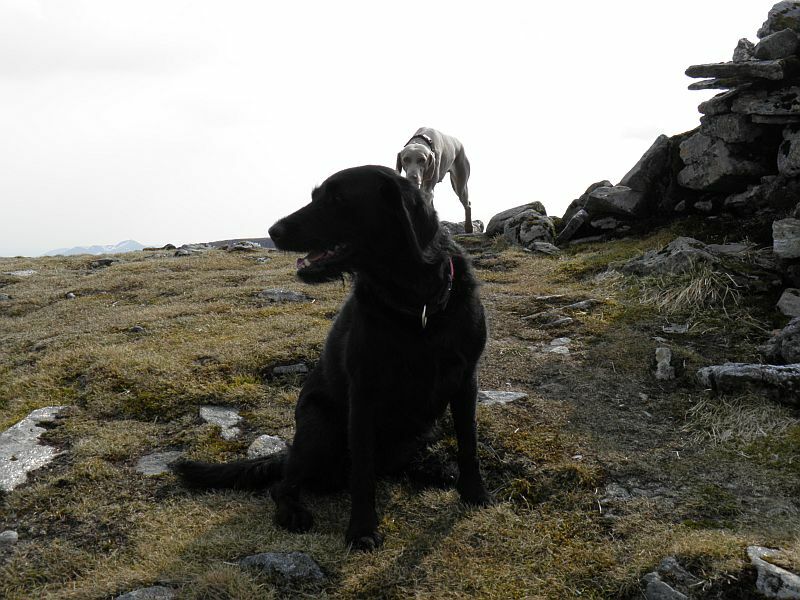 Post a few words about Carn Eighe or read what others have had to say. Must thank Mullardoch boatman Angus Hughs. He took us to Glen Affric car park the previous night to drop our car off, then brought us back to Cannich.He picked us up in the morning and took us along the loch to the foot of Beinn Fhionnlaidh. We took a route up east of the Allt Coire an Lochain when the ground eases cross the Allt Coire an Lochain and take to the NE spur of Beinn Fhionnlaidh. Across the tops of Beinn Fhionnlaidh, Carn Eighe and Mam Sodhail. Descended via Sgurr na Lapaich down to meet the land rover track that takes you down to Affric lodge. Excellent service from Angus. 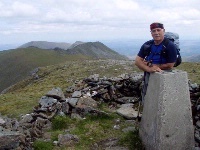 Climbed clockwise on 2nd April 2010. Magnificent views under clear blue skies all day. The Beinn Fhionnlaidh extension seemed to take ages in deep powder snow. On descent, the pinnacle ridge section along the ridge from Carn Eighe looked tricky under the snow so I cut down just before it where the corrie wall is shallow. This made for an easy descent but some wet walking through the saturated glen floor. Was impressed - and relieved - with the quality of the track across the moor on the way back. My advice is to walk this route in an anticlockwise direction ascending to the bealach below Sron Garb as the path is obvious from the river path. (I certainly was unable to find it on the way down). It is also safer to ascend the steep eroded path onto the ridge. The best descent is from Sgurr na Lapaich as the views down to Loch Affric are fantastic, it is also a much shorter walk back across the moor from here. 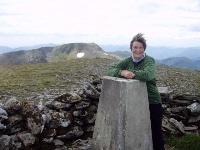 This is a great ridge walk on large majestic hills well away from the crowds. Did the 3 on a misty but dry-windless day. Took 8.5 hours but didn't hang around on the way. Did route exactly as is - don't think the 3rd distance measurement is 6 miles though. Tough navigation to find stalkers path on way down from point 1131 in mist so beware - also I missed the river crossing (a ford I believe)but was too tired to do anything but get wet. Didn't find it too hard to include Fionnlaidh though doing the reverse would have allowed a traverse of Carn Eighe on way to Mam Sodhail thats not an option doing it clockwise (not as far as I could see anyway!). Climbed these hills in one very long day, much loger than the 5.5 hours suggested. 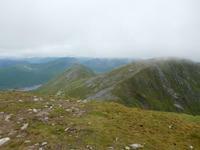 The decision to push onto include Beinn Fhionnlaidh isn't easy and the return climb back up Carn Eighe was exhausting. Then descended vis Gleann nam Fiadh, which was very wet and boggy, a very tireing end to the day, the gladdest i've been to get back to the car!